And it all began with a mouse! 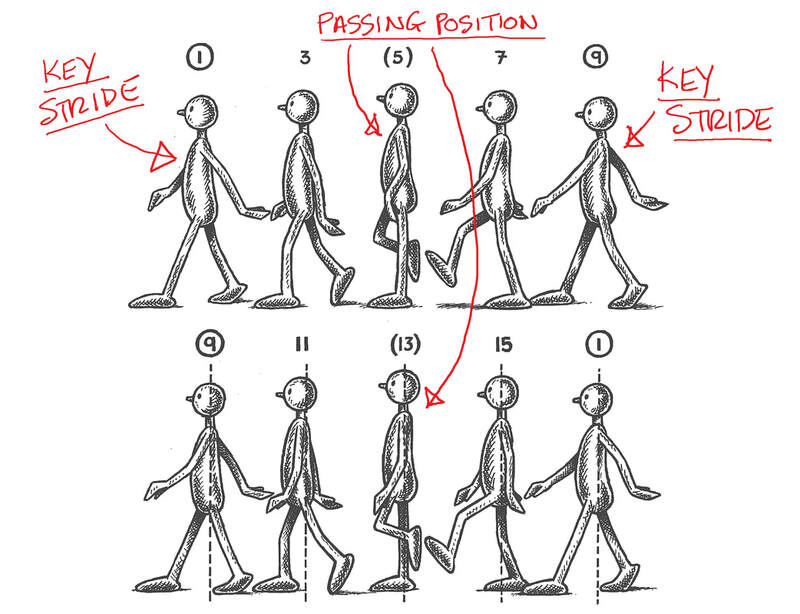 From an animation point of view the big difference of a double-bounce walk to that of a "generic walk" is that the body moves DOWN on the "passing position" of a double-bounce walk but goes UP on the other inbetweens. To clarify, here's a standard, generic walk that I sometimes use to explain walks to my students. . .
To achieve a standard, generic walk action you essentially have the body DOWN on the key stride positions but UP on the passing position. The rest are inbetweens - except for the free leg that has a couple of additional things going on that we won't get into now . . . However, the big difference with a double-bounce walk - as indicated above - is that the body on the passing position is DOWN, whereas the inbetween positions are forced artificially UP. (Note too that in order to get extra height on the inbetween positions the action takes place on the toes!) . . .
OK, that established . . . The challenge this month is for you to create a two-stride, double-bounce walk cycle using a character of your own choice. The most interesting submissions to me will be where (perhaps) the cheery double-bounce action conflicts with the nature of the character you're using. For example, this month is Halloween month pretty much all around the Western world. So consider doing a hideous monster or ghostly appirition doing a double-bounce walk in a most uncharacteristic way. The winning entry will display the best (and most spooky?) of all these things I would imagine! Submissions must be in by midnight on SUNDAY, OCTOBER 28th (Pacific Time).